Pioneers in the industry, we offer banarasi silk saree from India. Change your wardrobe and get classier outfits like this gorgeous purple color two tone silk saree. Ideal for party, festive & social gatherings. this gorgeous saree featuring a beautiful mix of designs. Its attractive color and designer embroidered design, patch design, stone, beautiful floral design work over the attire & contrast hemline adds to the look. Comes along with a contrast unstitched blouse. Change your wardrobe and get classier outfits like this gorgeous red color two tone silk saree. Ideal for party, festive & social gatherings. this gorgeous saree featuring a beautiful mix of designs. Its attractive color and designer embroidered design, patch design, stone, beautiful floral design work over the attire & contrast hemline adds to the look. Comes along with a contrast unstitched blouse. 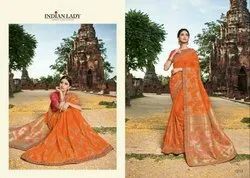 Change your wardrobe and get classier outfits like this gorgeous orange color two tone silk saree. Ideal for party, festive & social gatherings. this gorgeous saree featuring a beautiful mix of designs. Its attractive color and designer embroidered design, patch design, stone, beautiful floral design work over the attire & contrast hemline adds to the look. Comes along with a contrast unstitched blouse.